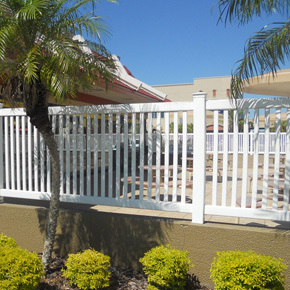 For the past 29 years, the professionals at David S. Smith Fence, Inc have been offering the businesses and residents of Central Florida with fence installations, repairs and rentals of the highest quality available. We pride ourselves on our customer service skills, and we will gladly provide you with a range of superior products and services, including wood, vinyl, aluminum, chain link and ornamental fences, as well as stairs and balcony railings. As a native Floridian, the owner of David S. Smith Fence, Inc has extensive experience dealing with clients from local businesses and residents of Central Florida. We proudly provide sales and installation of all types of fences, and we will handle your next fence project with superb quality and dedication from start to finish. We will coordinate all details of your fence installation, repair or rental, including sales, permitting, and overall satisfaction of a job well done. When you hire our company for your fence project, you can rest assured that the job will be completed with a high level of professionalism and exceptional quality. Your experience with David S. Smith Fence, Inc will be second to none! For further information, visit the Our Work page.